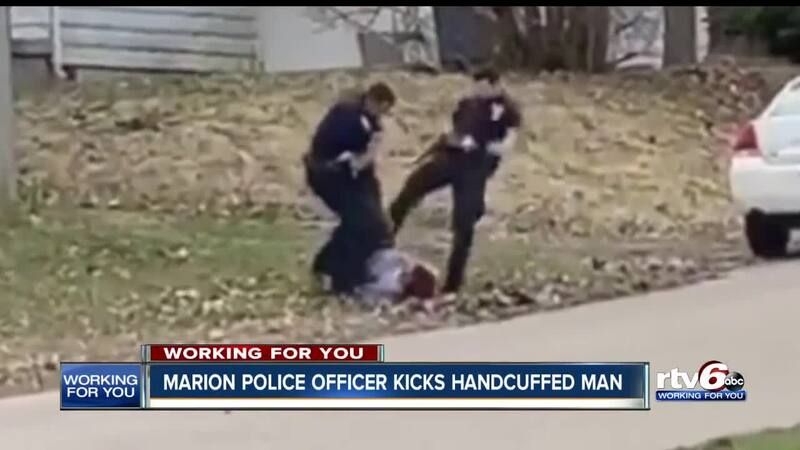 Marion police officer kicks handcuffed man. MARION, Indiana — A video that has been seen nearly 200,000 times is raising questions about use of force by law enforcement. The brief video that surfaced a few days ago shows a Marion, Indiana police officer kicking a handcuffed man on the ground. Jim White, an Indiana State Police officer for more than 20 years, wants people to understand every situation officers face is unique. "Many people are quick to judge what the police officers do, but most of those people have never walked in their shoes," White said. White also worked as the deputy director of the Indiana Law Enforcement Academy and he teaches at the O'Neil School of Public Environmental Affairs at IUPUI. "Certainly, the suspect is resisting," White said, while watching the video. A spokesman for Marion police said the man on the ground is 27-year-old Julian Paegle, who the officers spotted and recognized as a man wanted on two warrants. The officers apprehended him at a house where they said he resisted arrest. He was eventually handcuffed when he tried to escape again by running away. "OK, so he was handcuffed. Does that make a difference?" White said. "It does make a difference. It's difficult to justify the officer kicking him." The statement from Marion police said Paegle kicked at the officers, but you can't see it in the video. "He's handcuffed. Yes, he's kicking, but I'm not certain that requires the officer to kick back," White said. There's two officers there. They could overcome that suspect they have on the ground." White said officers are trained to use a like-force against a like-force. "The officer might require some re-training," he said. "If I were the supervisor, I would call the officer in and say, "Ya might think about this, maybe a kick wasn't warranted there." The video WRTV television station obtained is a 53-second snapshot of the situation. "What we see is only a fraction of what happens," White said. But White has advice for anyone who the police may come looking to find. "Comply with the officers," he said. "The officers tell you do something, do something." A spokesperson for the Marion Police Department said the officers in the video suffered abrasions and swelling after the incident. You can watch the full video shot by Nathan Smith below.